False alarm is one of the most important issues in video surveillance systems. If you use outdoor security cameras then these are the most common reasons for false positives: weather conditions (rain, snow, lighting, clouds, wind), animals (dogs, cats, rats, etc.) and birds, lighting conditions (reflecting, shadows). It could be very frustrating when along with important events you’ve got gigabytes of video with moving bushes or flying birds. Same goes to dozen of alerts and emails (sure, you’d like to be notified when there is something important is happening!) with a car driving past your door or moving tree’s shadows. This way it will be a job of work to find the crucial episode with a burglar trying to jimmy your front door. All these facts make it clear that a system with false alarm issues is as dangerous as no alarm system at all. There is an effective remedy to avoid or minimize the chance of false alarms in Xeoma CCTV Software – Motion Detector module and its settings. Thanks to a variety of criteria you can optimize work of your home security systems just the way you need it. 1) You can disregard motions shorter than a particular period of time (set by you), thus preventing motion detector from triggering when there are some insignificant movements you don’t want to be recorded (a falling leaf, time’s changing on the screen, etc.). The setting is very good for dealing with precipitations such as snow or rain. 2) Sensitivity threshold would also be your great helper at struggle with false alarms. The higher threshold sensitivity, the less movement is detected. By the time you’re playing with the threshold’s settings you will see if the movements are skipping or not in real time. 3) You can choose a detection method – Compare adjacent frames (two frames are being compared and more movement is detected) or Compare to the accumulated background (background is getting accumulated and less movement is detected, for example – the movement of swinging trees will not be detected, as this motion is constant and is already accumulated). The second is more applicable for recording outside, where there is always movements of trees, grass, clouds or something else. The first method will be good when you need to monitor an in-door area, where every movement is important. 4) Using a brush you can set custom areas you want to be monitored for movements. The parts can be of any size or any shape, as many of them as you like. Just paint red the needed zones. 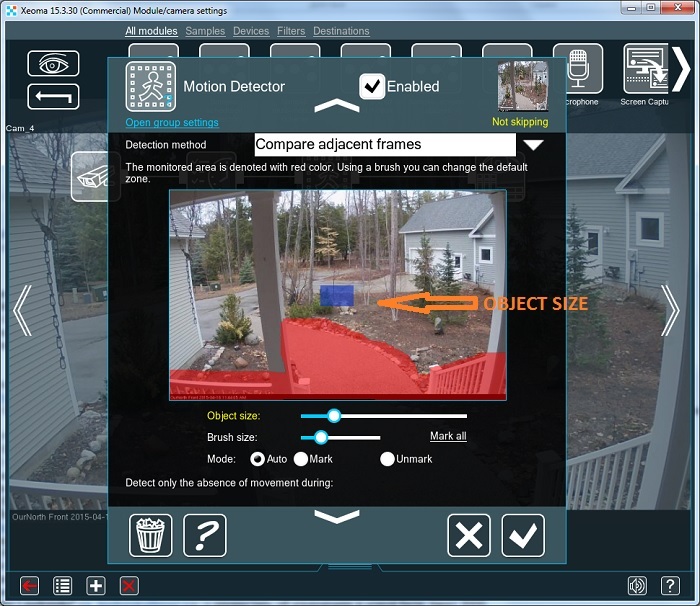 5) By setting the object size you can avoid chance of recording, let’s say, squirrels crossing your back yard, but every other moving object bigger than a squirrel will be detected. As soon as you’re done with setting your motion detector you can finally relax and be sure you and your property are safe! You won’t be bothered by false alarms anymore.